Upstate AHEC provides continuing education programs for healthcare professionals who seek licensure and certification credits. 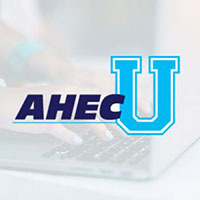 Participants throughout the State of South Carolina and nurses nationally are eligible to participate in Upstate AHEC trainings. A wide range of CE courses are available for various healthcare professionals, including Nurses, Physicians, Social Workers, Physical Therapists, Occupational Therapists, Pharmacists, Pharmacy Technicians and others. For convenience, Upstate’s continuing education programs are offered through three learning methods, live, on-line and video conferencing, and range from 30-minutes to multi-day, depending on the course.